There are quite a few references to old movies, many of which I have never seen, however, I was still able to follow along. If you've seen the movies mentioned, then you'll be more likely to appreciate the character's thoughts and references. As usual, I had mixed feelings with the ending. Overall, however, the book was a good read. If you read, or have read the book - let me know what you think! A tribute to classic film and true romance, LOVE WALKED IN tells the story of two women – one older, one younger – and the unexpected ways in which their lives are forever changed by chance. For thirty-one-year old Cornelia Brown, life is a series of movie moments, and “Jimmy Stewart is always and indisputably the best man in the world, unless Cary Grant should happen to show up.” So imagine Cornelia’s delight when her very own Cary Grant walks through the door of the hip Philadelphia café she manages. Handsome and debonair, Martin Grace sweeps Cornelia off her feet, becoming Cary Grant to Cornelia’s Katharine Hepburn, Clark Gable to her Joan Crawford. Meanwhile, on the other side of town, eleven-year-old Clare Hobbes must learn to fend for herself after her increasingly unstable mother has a breakdown and disappears. With no one to turn to, Clare seeks out her estranged father, and when the two of them show up at Cornelia’s café, the lives of Cornelia and Clare are changed in drastic and unexpected ways. 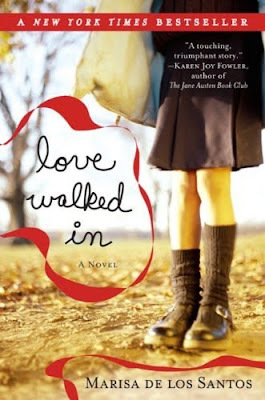 A cinematic and heartfelt debut that pays homage to the classic Cary Grant/Katharine Hepburn romantic comedy The Philadelphia Story, Love Walked In is sure to win over critics and readers of contemporary fiction. Serena, this book seems really interesting. I read quite a bit usually about social issues but I have to admit that I do like the romance novels but it has to have mystery interwoven into the plot. I believe that only those who have limited thinking would believe that what is in those books is the be all and end all in romance. I hope we can continue to share our thoughts. I also homeschool and we seem to have some other similarities. Visit and follow me at brainlessmomof7.blogspot.com.